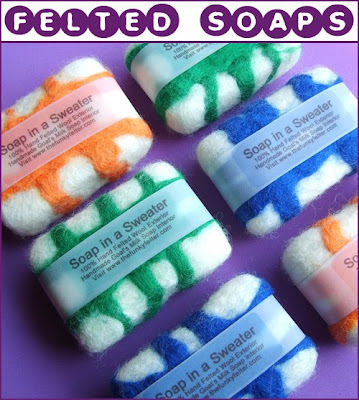 How to make a bar of handmade felted woolly soap! 5. To add stripes, lay out two small pieces of colored wool horizontally. Put the soap bar lengthwise at one end of the wool and roll it up loosely. (Figures E & F) You can also add vertical stripes or abstract embellishments. 7. Prepare a bowl of very warm water to finish felting the soap. 10. Thoroughly rinse the soap bar. Pat with a cloth to remove excess water. Lay flat to dry. (Figure K) Allow to dry 24 - 48 hours. Store in a dry place after each use. You can find soap felting kits available in my Etsy shop and my ArtFire shop. It is a fun, easy beginning felting project for most ages. It also makes a great natural all-in-one soap and scrubby to use or give as a gift. Thank you SOOOO much for posting this 'recipe'. I've loved these little soaps for quite awhile and wondered how they did it. The kids and I will have a blast!! These are great! I can't wait to try them. I think I might have to give them as mother's day presents! Thanks. It's an excellent and well-written tutorial! Thank you! Of course I sign this translate by your name and write a link to this webpage.